Here’s a close-up of my finished shirt. You can’t tell me it isn’t awesome, since that would be a lie. Take your ordinary, boring black shirt, and give it a spritz with bleach solution, making sure to get both front and back of the shirt. I found it helped to get some areas wetter than others, so you have a pattern of light spots on your shirt, which will be the background of your galaxy. Let the shirt dry completely – I prepared our shirts the day before painting. (Optional step: wash and dry your shirt; this keeps the bleach from eating away too much of the fabric.) Be careful not to get any bleach on yourself! I did this outside on the lawn, so we didn’t get bleach all over the carpet. Lie your shirt flat on the grass, sidewalk, or other flat-ish surface. (You can put cardboard inside the shirt if you like, but I found that not using cardboard gave the paint more depth, since it wasn’t all flat.) Mix up whatever colors of paint you’d like on your shirt. We had red, light blue, dark blue, yellow, and glow-in-the-dark, which we mixed to make lovely greens, purples, oranges, and such. I’m afraid it’s hard to see in this photo, but the white stars DO make a difference. Ta-da! Here’s my torso in my finished shirt. Bow ties are cool. Didn’t you know? It’s because the 11th Doctor wears bow ties. 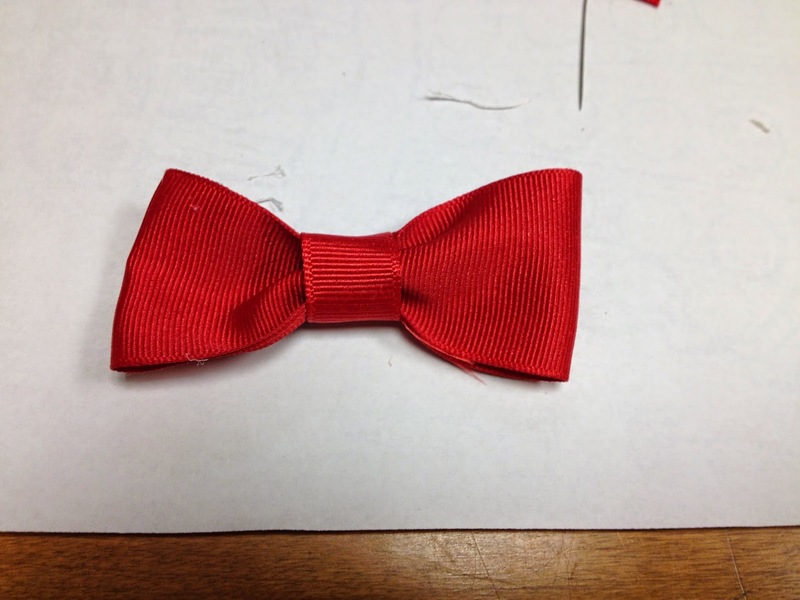 And we all want to be just like him, so… let’s make some bow ties! I’m wearing mine in my hair, but you could just as easily pin it to your shirt. I’ve always been very stylish. 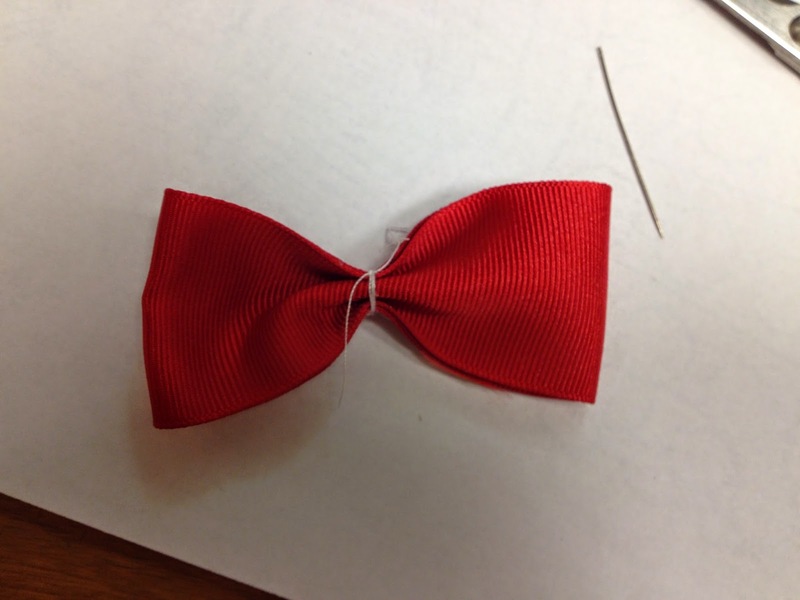 Decide what size bow you would like; mine is about 4″ long, which seems like a good size for this width of ribbon. 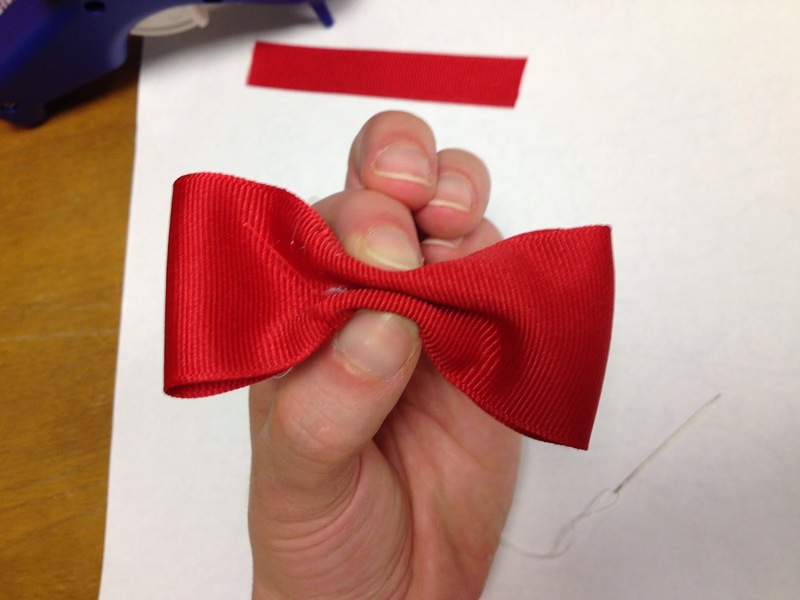 Cut your ribbon twice the length of the tie you want, plus about half an inch to overlap. 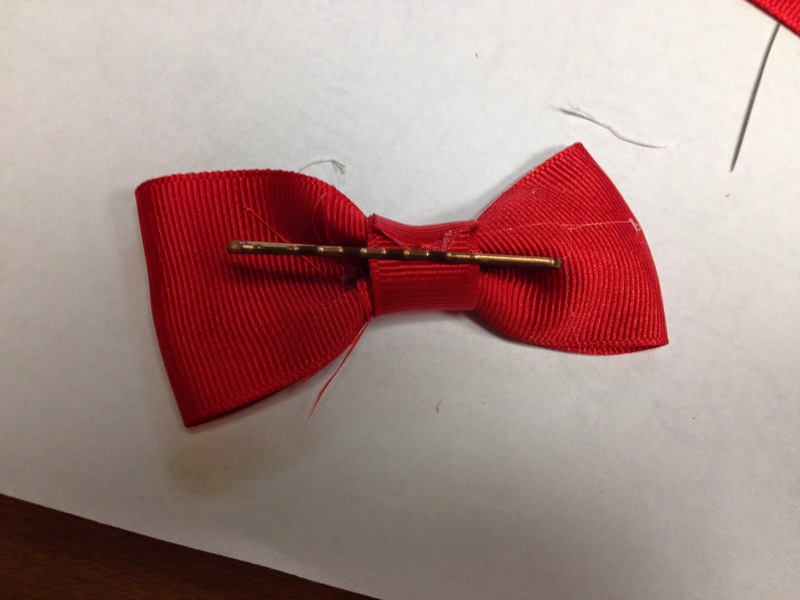 (For my 4″ bow, I cut my ribbon just about 8 1/2″ long.) 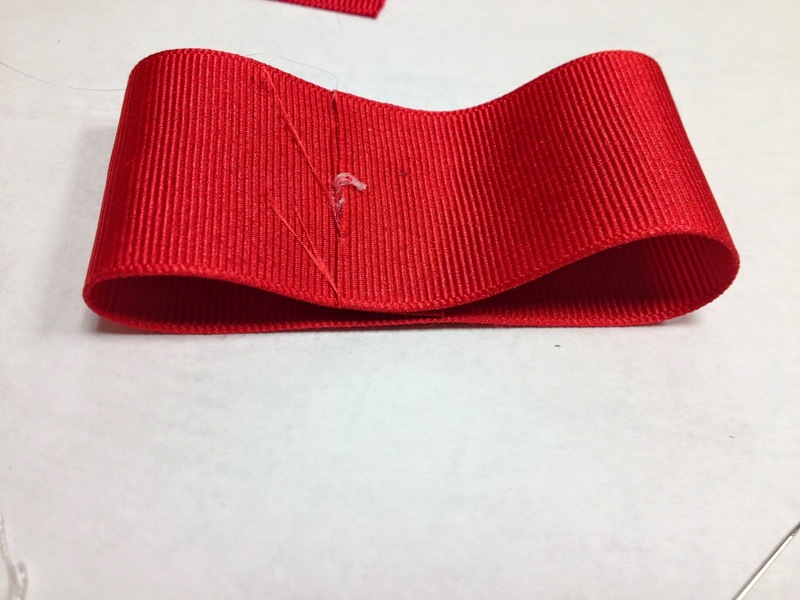 Cut a piece of your thinner ribbon about 3″ long. It doesn’t matter what color thread you use, since it’ll be covered up. Glue one end of the short ribbon to the top of the back (the glued side) of the bow, and wrap it completely around the middle, starting going down the back of the bow. 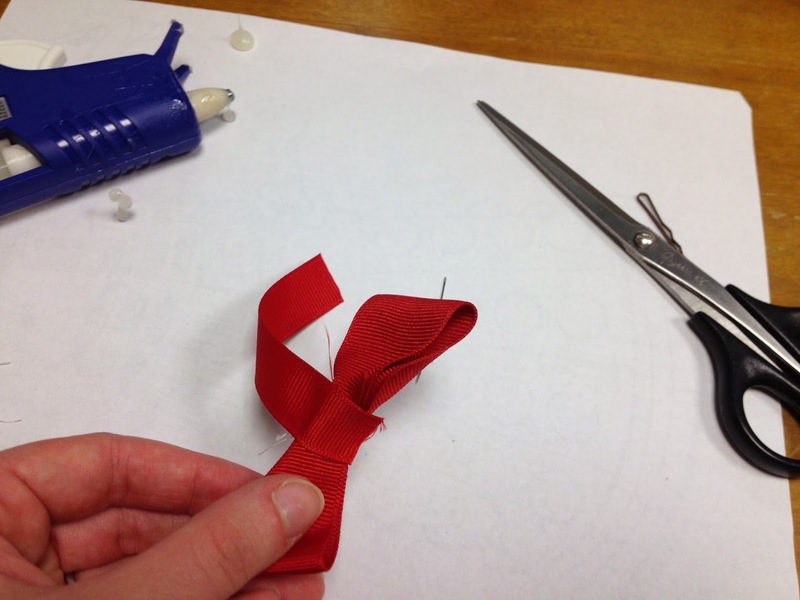 Glue the end of the ribbon to itself once it’s wrapped completely around. 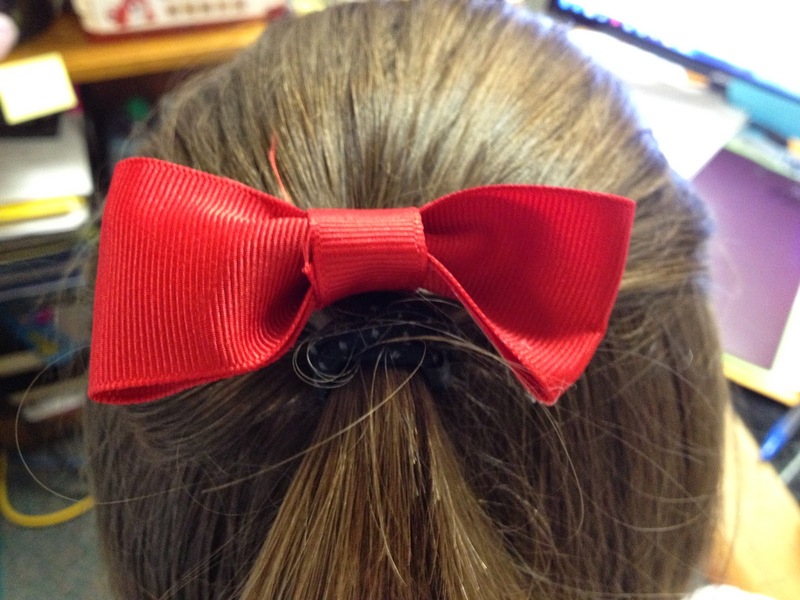 Slide a bobby pin (or other fastener – an elastic, a headband, or an alligator clip would work) through the middle portion of the bow. Attach and enjoy. What’s a bibliophile to do when there are books that won’t be read anymore? Turn them into art! Choose your book. Open it up by a chapter or two, so if someone opens the cover, it just looks like a normal book. Mix the glue with just a little bit of water until it’s the consistency of paint. 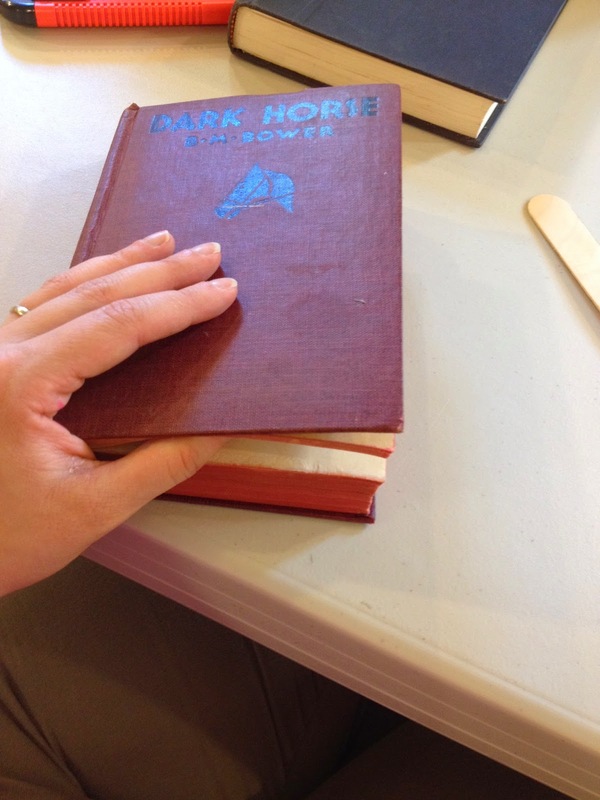 Holding the book open, paint the outside edges of the book with the glue. 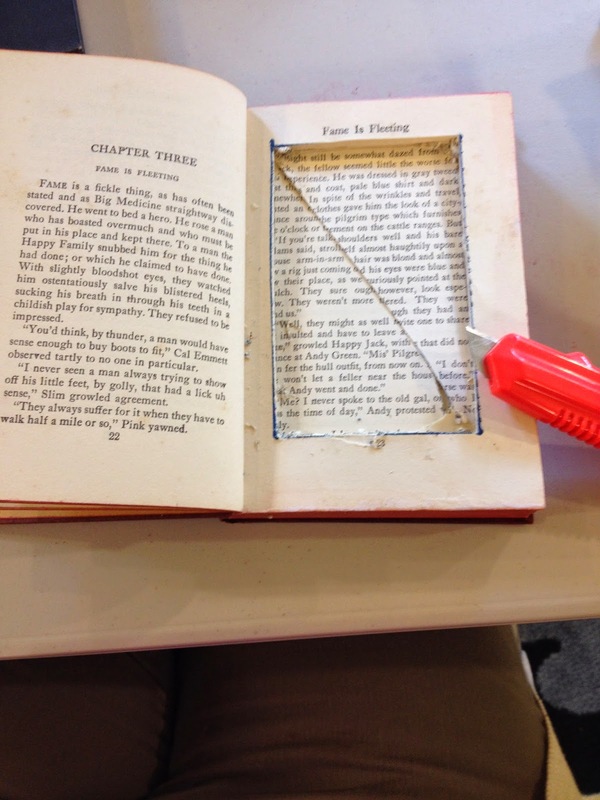 Once your book is dry (or you’re tired of waiting), open the book and carefully remove the scrap paper. Using your straight edge, draw a box around the part of the book that you want to hollow out, making sure it isn’t too close to the edges, since you want a nice, strong box. 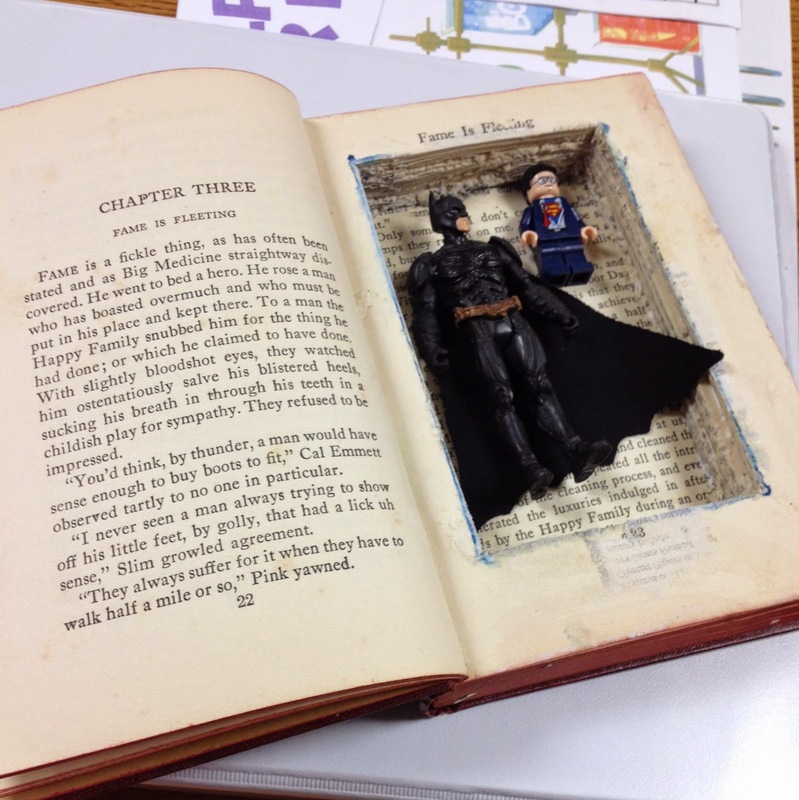 Sometimes it’s helpful to cut diagonally to lift the pages out. 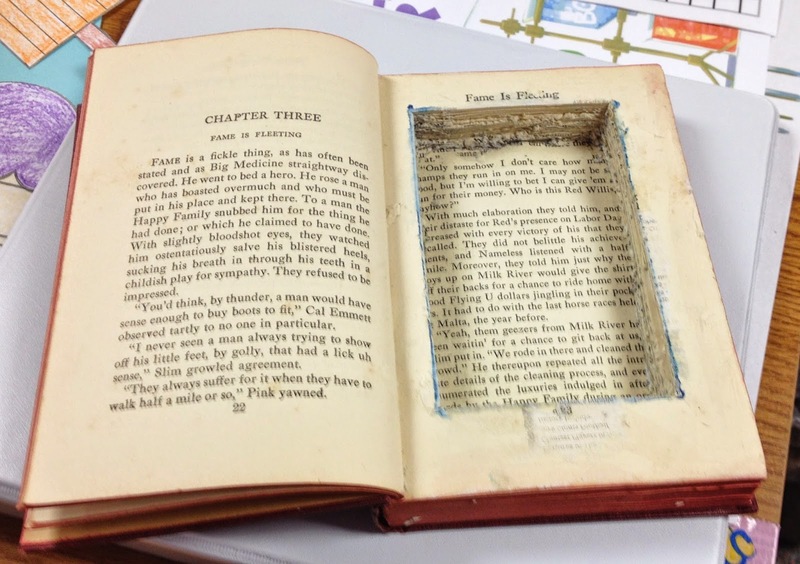 Once the hole is as deep as you’d like it to be, take your watery glue again and paint the insides of the cut edges of the book. 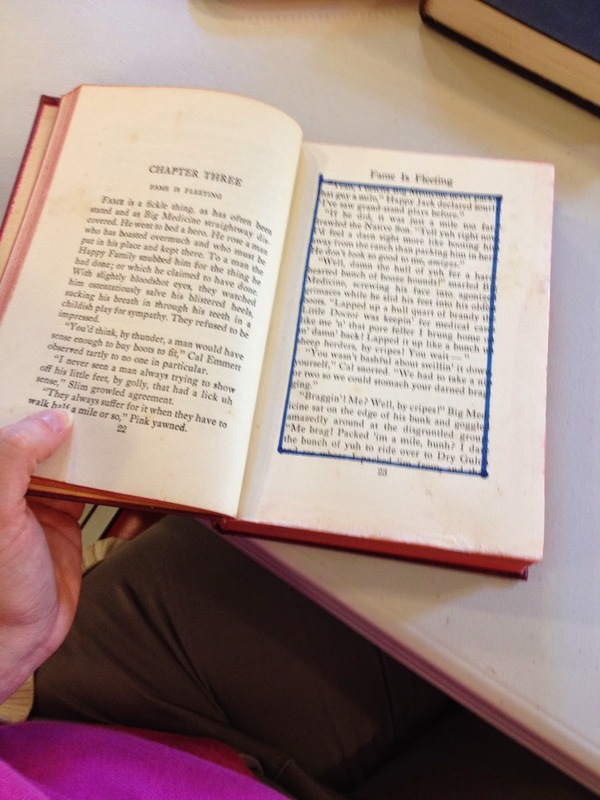 This is the time to repaint the outer edges of your book, if it came loose at all while you were working on the inside. It doesn’t look like much? Good! It’s not supposed to! * Corners are tricky. 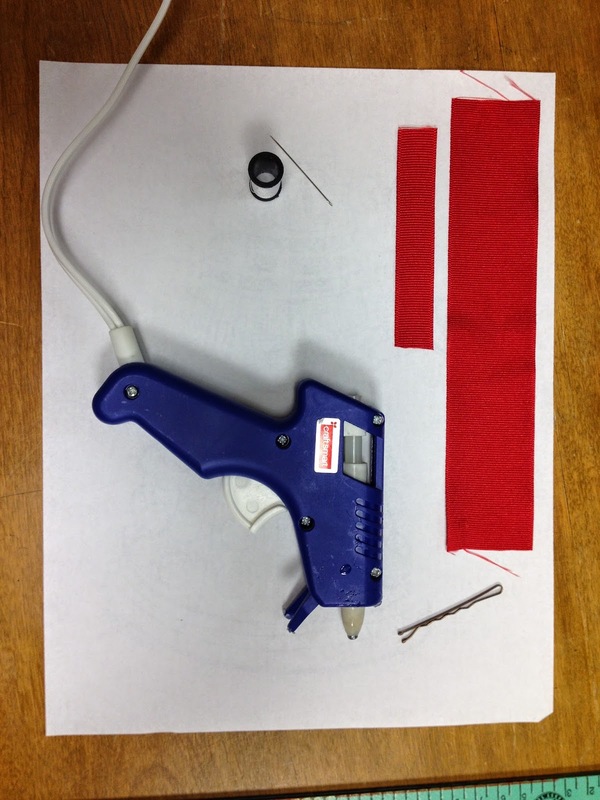 I found it helpful to start in the corner and cut toward the middle, then start at the opposite corner and cut toward the middle. It’s very hard to end a cut at the corner.